The term “Colorado Paradox” has been coined to describe the disparity between our thriving job economy and our deficit of high-quality public education. DATA’s K-12 Education Program, DATA ED, provides courses that make creative technological skills accessible to communities who are otherwise left behind. Arts have been proven to significantly increase the well-rounded success of students, hence the evolution of STEM to STEAM. Through our programming, we confront the persistent challenges and inequalities of the 21st Century by providing economically disadvantaged students with the engaging coursework they need to build self-confidence, risk-taking abilities, and relevant creative technical knowledge in STEAM subjects. The DATA ED Program works to empower underrepresented voices and to bridge the gaps of the “Digital Divide” through K-12 arts education programs and workshops that leave youth with lasting, impactful experiences and knowledge about emerging technology arts. 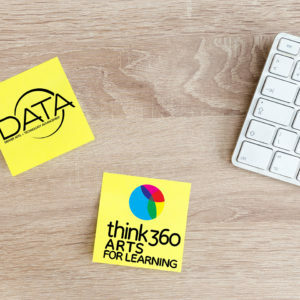 DATA is proud to collaborate with the Denver non-profit, Think 360 Arts. Think 360 Arts is similarly committed to cultivating the arts as an essential tool for enhanced learning. Build a pepakura structure and learn how to map the object with projected digital content that you create in class. This artform is at once an art, a science, and a professional skill – utilizing mathematical foundations for real world creative applications. Ex. : The Power Selfie – learn how to shoot empowering self photographs and create digitally overlaid affirmations and filters that boosts self confidence and teaches a skill at the same time. Bring your imagination to life through 3D modelling. Learn how to build worlds, characters, and objects in digital space. Bring them to life with animation, and put it all together with professional level rendering and post production techniques. Electronic computer based audio production is the new standard for music, film, and television composition. Develop the knowledge of professional level audio techniques from field recording to scoring films to electronic music production. Build your own custom video game controller, and use it to play a game that you also create from scratch! Combines elements of basic coding, video game design, and hardware electronics. Leap into the future with this primer course on the emerging field of virtual reality. Learn what it takes to create 360° videos, generate digital 360° media, and display it in consumer ready formats. Looking to step into the future of education, professional skill sets, and artistic output? Contact us!